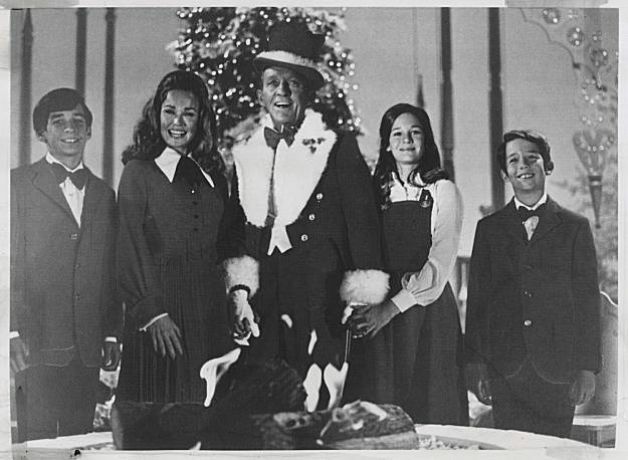 Bing Crosby memorably introduced this last of the popular Christmas songs to have a religious theme to most Americans in 1963, on this live broadcast of “The Hollywood Palace.” It was written in October of 1962 during the Cuban Missile Crisis, by a married songwriting team that wondered at the time if it would be the last thing they ever did. Noel Regney, who wrote the lyrics, was born in France and had studied music at the Strasbourg Conservatory and at the Conservatoire National de Paris. When France was overwhelmed by Hitler’s troops in 1940, he was conscripted into the German army. As a Nazi soldier, he secretly joined the French underground and served as a spy, passing information along to the resistance. Once he led German soldiers into a trap where they were massacred by French fighters who cut them down in a crossfire. He was shot too, but survived. To kick off the Not-Too-Early-To-Play-Christmas-Music Season, here is a Comment of the Day that adds another chapter to the Ethics Alarms commentary on “White Christmas,” the Bing Crosby-Danny Kaye musical film that is one of the five or six most resilient of the Christmas classics. The initial ethics analysis is here. The post that spawned the latest take was a rare guest essay by Ethics Alarms veteran texagg04. Now comes new commenter SykesFive to provide insight into the pivotal character of General Waverly, played by Dean Jagger. Among other things, he argues that one reason the general was so beloved was that he was poor general, treating the lives of his men as more important than his mission. I have a somewhat different take on this. I sometimes think I am the only person who thinks so much about the Waverly character. As the scene opens, Major General Waverly is being relieved for frankly the only reason American unit commanders were relieved during the war: he didn’t take the objectives. That is failure. It could be lack of aggression or poor coordination or anything else, but ultimately it is failure and the commanding officer will pay the price. He will be shuffled off to a rear area command, or maybe just left to bum around the theater, and be out of the Army by the end of 1945 because his record will be so tarnished. He will be lucky not to revert to his prewar rank. Waverly’s age suggests he was a company-grade officer during WWI and may or may not have seen combat during that conflict’s closing weeks, then spent decades idling in the interwar army. Apart from whatever happened in 1918, Waverly has no more combat experience than anyone else in the division. He is not an experienced commander by any measure. He had the right credentials–a few articles in service journals, no serious problems on his posts, and of course a West Point Ring–but had never really been tested as a field-grade officer. Again this is a common profile.This is a very common profile for WWII US Army division commanders. Ethics Alarms commenters who are honored with the annual “Commenter of the Year” title in the yearly Ethics Alarms awards have the option of joining the elite ranks of guest bloggers here. Texagg04 got the honor a couple years ago but never exercised his option. His recently posted, meticulously-researched and fascinating multi-comment addition to my 2012 post about the holiday film “White Christmas” seemed too extensive for a mere Comment of the Day, and I asked tex to edit it into a single post. He agreed, and what follows is the result. I recommend seeing the film (it’s on Netflix) either before of after reading his analysis. The 2015 update to the 2012 Ethics alarms “White Christmas” post is here. As the kids were watching “White Christmas” and I walked by, in passing, I noticed something amiss about the “military” feel of the opening scenes that seemed off ethically. So I copied and pasted the first website that claimed to be a script of White Christmas. I’m not sure what it was…if it was a working copy or a first draft, but it has significant differences from the actual filmed scenes. So, I’m forced to modify some of my assessment from the original three posts. All the dialogue is transcribed *directly* from the listening to the movie, so I think I’m pretty close to word for word. The scene descriptions and action statements are modified versions of the script I got from the original website (which can be found here). At the rate things are going, I am certain that before long no pop vocal interpretations of traditional Christmas music will be easily accessible on the radio. This is a cultural loss—it’s a large body of beautiful and evocative music—and someone should have, one would think, the obligation of preventing it. But I have no idea who. I just watched“White Christmas” again when my wife wasn’t around (she hates it), and was again struck by how entertaining it manages to be while making no sense at all and containing one ethics breach or gaffe after another. Ethics Alarms did an ethics review of the film in 2012, and reading it now, I realize I was too kind. This is an update. Yes, I still get a lump in my throat when the old general, played by Dean Jagger, gets saluted by his reunited army unit, which has gathered at his struggling, snowless, Vermont inn on Christmas Eve to remind him that he is still remembered and loved. Nonetheless, it is by far the strangest of the Christmas movies, and also the most unethical. Though everything works out in the end, the characters in the sloppy plot spend the whole movie lying, extorting, betraying, manipulating and generally mistreating each other, always with no recriminations at all, and usually with no consequences either. Bing dismisses Judy’s cheat by noting that everyone “has an angle” in show business, so he’s not angry. Rosemary is, though, and reprimands Bing for being cynical. That’s right: Vera/Judy uses their brother’s name to trick two Broadway stars into watching their little act, and Rosemary/ Betty is annoyed because Bing/Bob (Bing’s bandleader, look-alike, sound-alike brother was also named Bob) shrugs off the lie as show business as usual. True, Betty is technically correct to flag the Everybody Does It rationalization, but shouldn’t she be grateful that Bob isn’t reaming out the Haynes sisters and leaving the club in a huff? OK, nice and uncynical is better than nice and cynical, but Bob is still giving her and Judy a break. As we soon find out, however, Betty is prone to flying off the handle. Why Don’t People Understand What’s Unethical About Nepotism? I suppose it is part of the larger problem that people don’t understand what’s wrong with conflicts of interest, and thus fall into them too easily. At its core, nepotism always, always, creates a conflict of interest for the supervisor, boss or manager, or leaves a strong suspicion of one, which is just as bad, the epitome of “the appearance of impropriety.” Nepotism simultaneously destroys the organization’s members’ trust in leadership—Was he or she objective? Was love and loyalty to a child rather than merit and the best interests of the organization behind the decision? Were there objectively better candidates? Will this bias harm me? —and the hired, no matter how good or qualified the son or daughter may be. If the organization declines and heads have to roll, the suspicion will always be that favoritism protects the offspring. If the organization is successful, there will still be a widespread belief that Sonny Boy or Darling Daughter is whispering in the parents’ ear, a mole, on the side of the parent rather than subordinates. Nepotism almost always destroys any organization’s morale, trust, and cohesion.